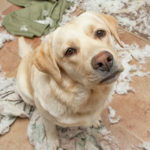 When dogs encounter a stressful situation, such as having company over, they get wild. From a dog’s point of view, these are either “intruders” or friends that cam to play. Eventually, by following your body language, dogs will calm down when new people come over. But for that 30 minutes or so, it can be embarrassing, irritating and sometimes dangerous. Another reason these type of “chill pills” are used is for separation anxiety if your dog chews on everything when you leave the house. What can be done? The first thing to emphasize is that no kind of human prescription drug should be given to a dog without a vet’s assurance that it is safe. Further, no vet worth her degree will prescribe a tranquilizer for day-to-day events like having company. They are too strong and risky. The good news is there are several products on the market than can help. They use either amino acids, scents or are herbal based and deemed safe. Nonetheless, it is always good to talk to your vet in case there could be complications with your pet’s medical condition. The products listed below have had positive effects overall. But what one needs to remember is that these products need to be used in tandem with a behavior modification program. None of these are meant for you to just “pop a pill” to your dog and be done with it. They are meant to relax your dog enough so that he or she can listen and follow your commands. 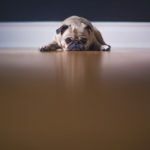 So, once your dog is calmer, then you can work on not jumping or barking by using treats and other positive reinforcement techniques like crate training. If you try to only use these products, it is likely you will be disappointed with the long termresults. Composure: A product from Vetri-Science Laboratories, this is a supplement that uses Vitamin B and L-Theanine to work with your dog’s immune system and generate a calming effect. Reading reviews, this product seems to work in most situations, except extreme ones; but even then, it is reported to help somewhat. This is the primary product available that does NOT use herbal ingredients. Adaptil: Another product that is not herbal-based, this is a product that has been around for some time. It is manufactured by the respected company Ceva. The way it works is it mimics the smells (pheromones) that a mother dogs releases to her litter a few days after birth. This gives puppies a “warm, safe” feeling. This treatment is based on the idea that dogs experience the world primarily through smell. So calming smells lead to a calm dog. Aromatherapy: Lavender scent has a calming effect on people and dogs. This kind of treatment is becoming more and more popular and many vets include it in their overall treatment programs. Rescue Remedy: This is a tried and true homeopathic remedy that has been on the market since the 1930s. It was designed and created for humans and is still packaged this way. However, it is totally safe for dogs. It is made from flower essences. The product comes in a small vile with an eyedropper. Ultra Calm: This is a supplement that is based on Valerian Root and Chamomile. This product has to be given to dogs before the stressful situation and can even be given to dogs daily in smaller doses. This product comes in “treat” sized bites that your dog will enjoy having as part of his or her training program. 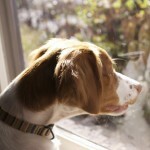 When dog owners have a stressed-out dog, it is important to remember that dogs focus primarily on smell and behavior. This is how they interact with the world. By keeping your own scents and behaviors pleasant to dogs and using the above products, you will help relax your furry friends.